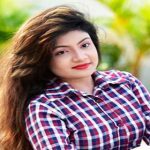 Falguni Rahman Jolly is a Bangladeshi emerging film actress and television model. She comes to the showbiz industry of Bangladeshi with the Jaaz Multimedia’s movie ‘Angaar’. Jolly draws the attention of the audience by her wonderful acting performance within very short time. She has an attractive and nice looking physical appearance that can stun anyone very easily. Now, the actress is a familiar face to the audience of showbiz industry Bangladesh. Falguni Rahman Jolly was born on August 24, 1996, at Savar, Dhaka, Bangladesh. She has three siblings. Father Selim Chowdhury is a businessman and the mother Sahin Chowdhury is the housewife. Jolly brought up in Dhaka. She was so much passionate about media arena from early childhood and learned singing and dancing from Shishu Academy. Once she engaged with the Jaaz Multimedia then went to India to take training on the different subject of showbiz under the organization. Falguni Rahman Jolly made her acting debut in the film industry with the movie ‘Angaar’ in 2016 with Om and Amit Hasan. In the same year, she appeared in the movie ‘Niyoti’ with Arifin Shuvoo where Jolly made a wonderful acting performance. Following the year, she appeared in the movie ‘Meyeti Ekhon Kothay Jabe’. In 2017, she starred in the movie ‘Obak Prithibi’.